Stop A is located at the entrance to the Historic State Park and Old Town Market, featuring over 40 specialty gift shops. Across the street is the historic Immaculate Conception Church. Stop B is located at 1004 N. Harbor Drive along the Embarcadero near the USS Midway Museum and the cruise ship terminal. The San Diego Visitor Information Center is nearby including the Maritime Museum and the Star of India. Stop C is located on the east side of Seaport Village next to the Bay Company. Stop D is located in the front of the Marriott Hotel at the Waterfall. Stop G is located on East Harbor Drive, under the pedestrian bridge. Stop H is located at Mc P’'s Irish Pub & Grill on Orange Avenue, the main shopping and dining area of Coronado. Hotel Del Coronado is 2 blocks south. The Coronado Beach is approximately 2 blocks away. Stop I is located in the heart of Balboa Park near the corner of President's Way and Pan American Rd. behind the Organ Pavilion Parking Lot. Stop J is located in the heart of Little Italy, next to Buon Appetito. San Diego’s Star of India is the ‘world’s oldest active sailing ship’. When many were still being created out of wood, this iron ship built in 1863 was a great experiment. Beginning the stages of her life known as Euterpe, this full-rigged ship continued until changes were made almost four decades later. The ship’s sailing began with rough seas. Within two trips to India she endured a cyclone, the death of her first captain, collision and a mutiny. Surviving this difficult beginning, she was turned into a cargo ship and returned to India four more times. In 1871, her ownership turned to London where she began a 25-year run of moving British emigrants to the South Pacific. In that quarter century, she circumnavigated over twenty trips. Her log suggests those trips often found her ‘laboring and rolling in a most distressing manner’, but she was the little iron ship that could. Life for the ship was as difficult as it was for those aboard. Emigrants spent time in cramped quarters, with limited rations and suffering disease and malnutrition. Although some perished during the journey, most saw a successful life in their new home of New Zealand. Located in the Marina District near the Gaslamp Quarter, the San Diego Convention Center was designed by Arthur Erickson, a Canadian architect. Boasting more than 600,000 square feet of exhibition space, it is the 24th largest facility of its kind in North America. The roof of the Sails Pavilion is the building’s most distinctive feature. The Teflon-coated fiberglass panels summon images of ship sails and reflect the maritime history of the city. Another unique feature is the outdoor, inclined elevator. Completed in 1989 and expanded 12 years later, the convention center hosts major political, business and entertainment events like the annual Comic-Con Convention. Hop aboard Old Town Trolley Tours for a picturesque evening you won’t forget. With the help of our expert guides, you’ll take in romantic views of the city and cruise past notable landmarks, experiencing them like you never have before! 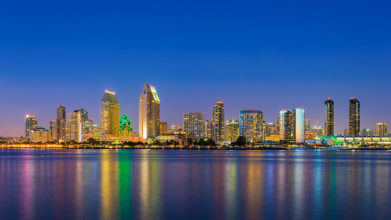 With its gorgeous waterfront locale in the heart of downtown San Diego, the Marriott Hotel and Marina is a sight to be seen – If you’re residing here during your stay, it’s a convenient way to catch the Old Town Trolley Tour of San Diego. There’s a hub of activity to view in the harbor, and right next door is the spectacular San Diego Convention Center where a variety of events, conventions and special activities take place throughout the year. Known the world over for his animation creations, Chuck Jones is perhaps the most famous animation artist in the world. In this special gallery, see the beloved characters he penned including Bugs Bunny, Daffy Duck and all the other original Looney Tunes and Warner Brother’s cartoon characters. From prints and sculptures, this 5th avenue space is a great celebration of Jones’ incredible talent and great fun for all who visit. Located on the corner of 5th and E in the Gaslamp District, Vin De Syrah Spirit and Wine Parlor offers wine connoisseurs and anyone who enjoys a glass of wine along with cheeses and desserts, a totally eclectic experience. Step into this contemporary lounge and enjoy cool jazz, candlelight and an array of wines, spirits, beers, martinis and more. Take a moment to gaze at the colorful, whimsical work of art by Niki de St. Phalle. Her statue titled Coming Together stands 38-feet high in front of the San Diego Convention Center. A ceramic and mirror mosaic, Coming Together portrays a human face divided in half with one side mirrored and the other side multi-colored. Pandas, penguins and rare plant life are just a hint of what you’ll see when you visit the world-famous San Diego Zoo. Throughout its 100 acres, you’ll feel as if you’ve traveled around the world as you see some of the most intriguing and rarely-seen animals lounge in their natural, expansive habitats. With more than 4,000 animals representing 800 species, the San Diego Zoo stands out among other zoos for its diverse wildlife citizens. Throughout the nation, Little Italy neighborhoods symbolize the tremendous contribution that Italians have made to the culture and history of the United States. Covering a gorgeous and walkable 48-square-block area of northwest downtown San Diego, this ethnic enclave is the largest of its kind in the country. Hosting several festivals throughout the year, the neighborhood boasts street-side cafes, art galleries and a beautiful urban park.